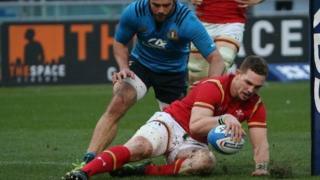 Wales rugby star George North is among those who will be honoured by the Gorsedd of the Bards at this year's National Eisteddfod. Recipients will be presented with their robes at special ceremonies on the eisteddfod field in Bodedern, on Anglesey. The eisteddfod runs from 4-12 August. The Wales football team's assistant manager, Osian Roberts, who helped the team to reach the Euro 2016 semi-final, has already been named honorary president at this year's festival. Individuals who have succeeded in the fields of law, science, sport, journalism, media, local and national activities will become honorary druids and will be presented with blue robes. The gorsedd also honours new members with green robes for their contribution to the arts.